Join us for Claudia's newest workshop-only pattern, "A Child Is Born!" It is as inspiring as it is full of spiritual wonder. 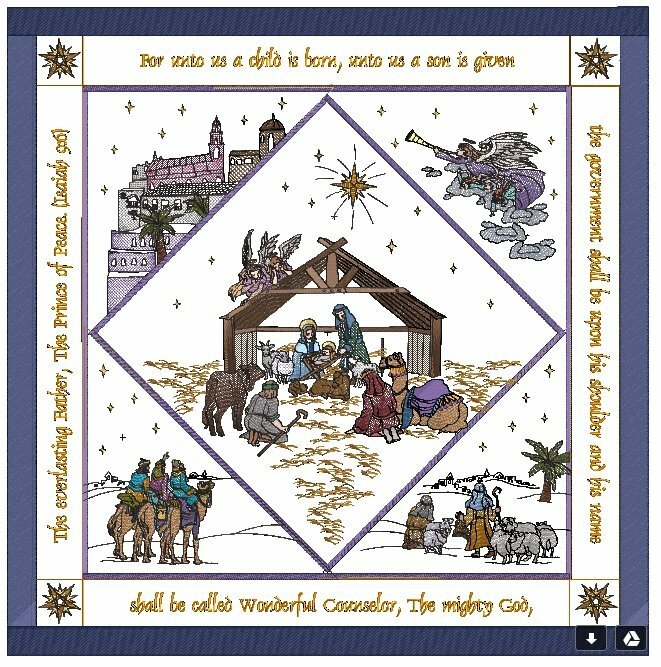 Enjoy the vast expanse of stars in the sky and the traditional elements in every beautiful Nativity...the angels on high, the little town of Bethlehem, the wise men, the shepherds, their sheep, and of course, the Baby Jesus, Mary and Joseph. This workshop is designed for the experienced beginner, intermediate, and advanced students. At this workshop, students will master Claudia's multi-hooping technique for perfect placement and alignment. Improve hooping skills; better understand the features on your machine that allow you to tweak the position of a design within the hoop. You will also get tips and techniques to help keep your embroidery flat, fun, and flawless! Remember this pattern is only available at the 2-day workshop! This class is filling quickly! If you do not want to miss this wonderful opportunity to master another beautiful Claudia Dinnell design, do not wait till the last minute. Class size is limited.